photo: Curtis Walker had 33 points in the double-overtime loss to Everett. photo by Rick May. Bellevue guard Curtis Walker’s three-pointer within the first 30 seconds of the game was an early sign that the Bellevue vs. Everett contest was going to be a shootout as it took two overtimes for the visiting Trojans to overtake the host Bellevue College Bulldogs 110-108 last night at Courter Family Athletic Pavilion. Walker was dominating with 33 points and 18 rebounds; both game-highs last night but the ‘dogs came up just short in their valiant effort at upending the North Region’s first place and undefeated team. The game was dead even from the get go as Bellevue held a one-point lead at 40-39 heading into the locker room at halftime. The game went back and forth in the second half as Malik Sanchez led BC with 13 points in the half. Sanchez’ jump shot with 21 seconds left in regulation tied the game at 81. Everett’s Elijah Seybold had a chance to win it but missed with :02 on the clock to send the game into overtime. 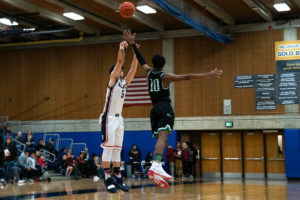 The Trojans appeared to be on their way to victory, stretching the lead to six at 92-86 with two minutes to go but the ‘dogs Emmanuel Siale and Sanchez dropped in two quick buckets to put Bellevue right back in it. With :19 to go Walker drained both attempts at the free throw line to tie the game at 92 to send it into the second overtime. The teams continued to exchange blows until Everett stretched the lead out to five with :10 left on the clock which was enough for the Trojans to hold on. In a must foul situation, Bellevue sent Everett’s Phalon Maddox to the line. Maddox proceeded to make both free throws with five seconds left to seal the win. Bellevue is now 3-4 in league (12-8 overall) while Everett moves to 7-0 (15-7 overall). The win gives Everett more breathing room for first place as the teams enter second round play for the North Region. Bellevue’s loss puts them in a logjam with Skagit Valley, Shoreline, and Whatcom for fourth place. The Bulldogs host Peninsula next Wednesday February 6 at 7:00 p.m.